The Ricoh Theta Z1 is Ricoh's latest spherical camera, updating the Ricoh Theta V, and uses a new 1inch sensor (x2), to create 23 megapixel resolution 360° images in a single shot, with a resolution of 6720 x 3360 pixels. Ricoh say the camera is ideal for virtual reality (VR), social media, business, real estate and more. The camera features a new aperture priority mode, letting you select the aperture, with options of f/2.1, f/3.5 and f/5.6 available. Program, ISO priority, Shutter priority and Manual shooting modes are also available. Video can be recorded as 4K video (3840x1920), at 30fps with 3-axis rotational stabilisation. The camera has 4 microphones built-in to independently record sound from 4 different directions when recording video. It also supports 360° live streaming in 4K. There's a compact 0.93inch organic EL monitor, and a function buttion, giving additional information including the number of remaining shots, exposure settings, and battery life. Wi-Fi and Bluetooth are built-in letting you control the camera from your smartphone. You can also shoot Adobe DNG (RAW) images. You can view a number of sample photos on the Ricoh website. The camera is running on Android, and uses a Qualcomm Snapdragon processor, letting additional plug-ins be added. Underneath the camera is a standard tripod socket, as well as a USB Type-C connection. There is 19GB of storage built-in to the camera. 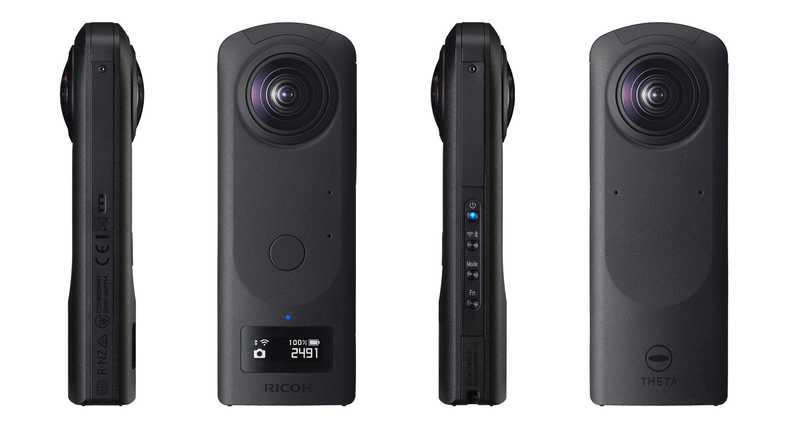 The Ricoh Theta Z1 will be available from April, priced at £899.